Twice a week we go out to give our customers the experience of a lifetime. 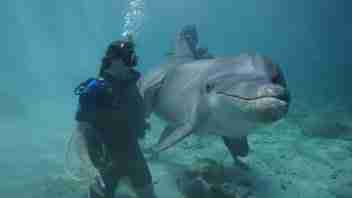 Diving with Dolphins! A unique open water diving experience provided exclusively in Curaçao by Ocean Encounters Diving and Dolphin Academy. After our dive and dolphin interaction briefing, you will gear up and take a short boat ride to Shipwreck Point. 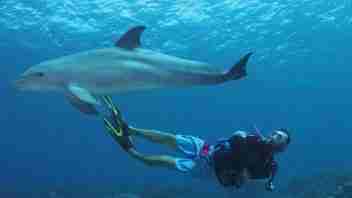 Once underwater, you will meet dolphin(s) and their trainer for an amazing experience on a beautiful reef. On this dive you will get up close and personal with these amazing animals and maybe even pet them. Bring your camera they love the attention! You do not have a PADI or SSI license yet? Join us for our Dolphin Dive for Non-Divers Trip. Mask/Snorkel, Fins, Wetsuit, BCD & Regulator. The boat departs from the dock at these two locations! Just make sure you are available 15 minutes before departure. We are happy to transfer you from anywhere between Blue Bay (most west) and Jan Thiel or Santa Barbara Resort (most east). Video of the dive available for $70 at Dolphin Academy’s video department. Do you have locker rooms? We have a locker room to store your dive equipment both at Lions Dive Resort and at Sunscape Resort. It is locked outside of opening hours (8:00 – 17:00) but you can get a key for night dives. Our Dive master will provide a pre dive briefing, and will also be guiding the dive. Do you have DIN tanks? We have both DIN and yoke tanks. Do you have dive computers? We rent Cressi Leonardo computers and have a variety of dive computers for sale in our shop. Our staff can advise you which computer is right for you. Nitrox reduces nitrogen stress on your body. Your extended dive will be much more enjoyable. * These times are for Lions Dive Ocean Resort and Sunscape Resort. Please add some extra transit time to our location for (optional) pick up anywhere else. We'll plan transits during booking together. Welcome to Ocean Encounters Diving, Your One Stop Dive Shop. Ocean Encounters is Curacao's premier PADI and SSI Dive Center, offering a broad range of diving and snorkeling activities, including exciting boat diving trips for all skill levels and a variety of snorkel trips. 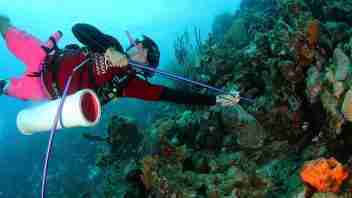 PADI and SSI courses from Discover Scuba to Professional level and specialties.